Don’t miss the opportunity to experience a rare total solar eclipse in western North Carolina near Asheville on Monday, August 21, 2017. Jackson County, Swain County and Graham County – all located about 50-70 miles west of Asheville – are the few areas in our state where you can totally experience the extremely rare celestial phenomenon. Towns in the direct path include Sylva, Dillsboro, Cashiers, Bryson City, Cherokee, Franklin, Highlands and Robbinsville, with one to two minutes of complete darkness as the moon moves in front of the sun. 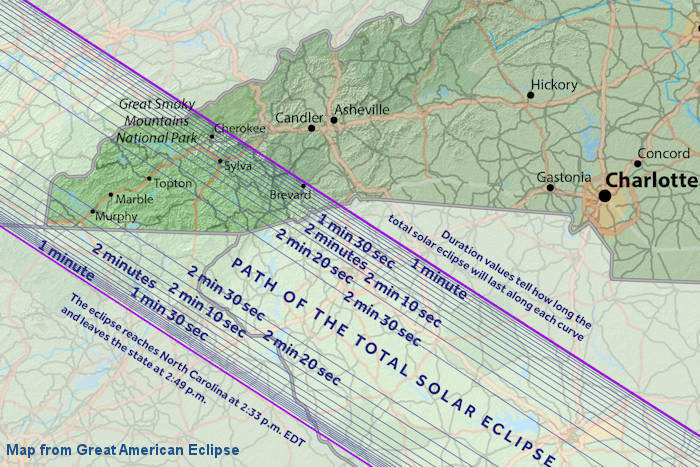 Even the city of Asheville will see a 99% eclipse – but not total darkness. People will be traveling to this area from around the world to experience this amazing event. At 2:36 PM, the Carolina blue sky will turn pitch black. Temperatures will drop, and stars will come out as the sun disappears. While the total eclipse is just a couple of minutes, the transition will begin about 1 PM and end around 4 PM. Since we expect many visitors, you should be at your viewing location well before noon. Other tips: Gas up and have food and water with you in case you are stuck in traffic for a while. See places to watch below! Weather forecast: As with most typical summer days in our mountains, afternoon showers and clouds are always a possibility. Even if it is cloudy, you will experience the total darkness. Cherohala Skyway: Our top pick for roadside viewing is this National Scenic Byway near Robbinsville since it will experience the longest period of darkness (about 2.5 minutes) and there are many overlooks to park. Or hike up to Huckleberry Knob – limited parking, so you need to arrive very early morning. Bring a picnic (no food, drinks or gas on the Skyway) to enjoy the entire afternoon of mountain views. Due to expected crowds, many areas will probably close early in the day. Read more about the Cherohala Skyway. Blue Ridge Parkway: The southern section of the Parkway will be in the path of total darkness (about 20-60 seconds of totality around 2:36 PM) – from around Looking Glass Rock overlook (Milepost 417) south to the end at Cherokee. While there are numerous overlooks to stop, most will fill up quickly. Portable toilets will be placed at many overlooks. Popular hiking spots to summits like Black Balsam, Devil’s Courthouse andWaterrock Knob will be packed. So go early to claim a parking spot! Rangers will allow roadside parking in any grass areas – you just need to be completely off the road. Sections of the Parkway will close if it becomes too crowded. Waterrock Knob has the largest parking area with prime viewing from the lot (44 seconds of total darkness) with picnic area and restrooms. See our Blue Ridge Parkway Guide for stops along this section, Milepost 417-469. Mountaintops: Hiking to a mountaintop with a view will be a very popular destination. However, most of these hikes are in the Nantahala National Forests with limited parking. Many will probably close. If you want to hike, arrive early in the morning and plan to spend the day. John Rock in Pisgah National Forest should have about 30 seconds of totality and it has a large parking area. More top spots for total darkness:Looking Glass Rock, Wayah Bald, Wesser Bald, and Devil’s Courthouse. Dillsboro: Park at Monteith Park (Old Home Town Road) for $2 and take a free shuttle 11 AM-4 PM into this artsy village with galleries, studios, shops and restaurants along the river. Also find extra vendors and a kid’s recreation! Eclipse glasses available for a small donation to the local Merchants Association. 1 minute, 50 seconds of total darkness. Brevard: West Jordan Street will be closed to traffic since it’s the prime viewing spot – about a minute of darkness. Stop by the “Heart of Brevard” booth for a free moon pie! The public is also invited to Brevard College to watch near Porter Center – with viewing glasses available. The event at Brevard Music Center is sold out. Franklin: Block Party downtown on Iotla Street, 1-6 PM, with 3 PM concert on the square. Total darkness 2 minutes 30 seconds. Free viewing glasses to first 1,000 people. Free moon pie and RC Cola to first 100 people! Try their EclipSmart binoculars in front of Town Hall. Kid’s zone too. Many downtown merchants will open at 8 AM. Pisgah Astronomical Research Institute: NASA scientists and hundreds of astronomers from around the world will come to this leading space research facility. Visitors can watch them at work. PARI is located deep in Pisgah National Forest and will be in total darkness for 1 minute and 47 seconds. General visitor tickets ($100/person) are SOLD OUT. They have some VIP event tickets at $750/person, a fundraiser for their outreach programs. Call Sarah at 828-862-5554. Go to their website for other star gazing eventsthroughout the year. 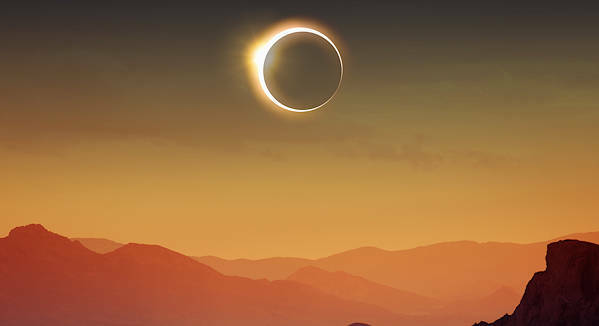 On August 11, 7 PM, PARI presents “Eclipse of a Lifetime” with a great overview of what to expect, campus tour and star gazing with telescopes, registration required, $20/adult. The campus will be open the Saturday before the eclipse with guided tours at 10:30 AM & 2 PM. Read more. Great Smoky Mountains National Park: The road to Clingmans Dome will be closed both Sunday and Monday to all motorists, pedestrians, and bicyclists. The park’s event at Clingmans sold out in five minutes and ticket holders will take shuttles in. ASA 360 will broadcast the eclipse live from there. Newfound Gap Road (US 441) will close when traffic becomes too congested (so we recommend staying away from that area). Oconaluftee Visitor Center at the entrance to the Great Smoky Mountains has a large field for viewing, with rangers answering questions. Expect a big crowd there. Cataloochee Valley will have a 99.7% eclipse, so the elk may come out to graze like they do at sunset. Sylva: Concerts in Bridge Park on Friday and Saturday nights. Free. On Sunday at 6 PM, science program with area astronomers and professors at Southwestern Community College at 6 PM (Balsam Building, 447 College Drive). Free. Dillsboro: The Summer Arts and Crafts Market on Saturday, August 19, will have 50+ local artists with demos, live music and more along Front Street. 10 AM-4 PM. Sapphire Valley: Arts and Craft Festival outdoors, 10 AM-4 PM, on August 19 and 20. Free admission. Located three miles east of Cashiers (100 Cherokee Trail, Sapphire). Free. Asheville: Shindig on the Green downtown on Saturday, Aug 19, 7-10 PM, a longtime favorite showcase of local Appalachian music and dance. Free. Tryon Equestrian Center: Saturday Night Lights with horse competition, music and more. Free. Lake Lure: The Dirty Dancing Festival is Friday night and all day Saturday with plenty of music and fun to celebrate the movie filmed here. Buy tickets in advance since it will sell-out. Robbinsville: Located near Cherohala Skyway, find festivities on Saturday, August 19, at Robbinsville High School (301 Sweetwater Rd) with a craft/antique fair 10 AM-5 PM with live music 7 PM-10 PM. 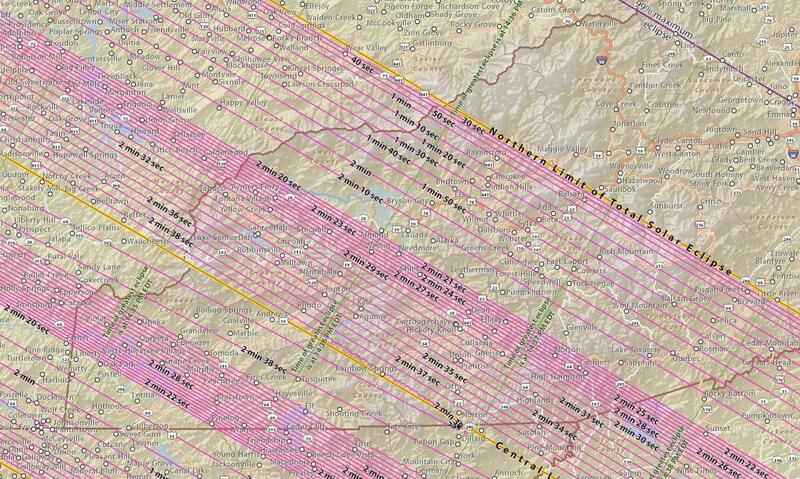 Download a detailed map of our NC eclipse area provided by NASA.